Life Unexpected: What age should you introduce horse riding? When I was younger all I wanted to do was take horse riding lessons. I had visions of never ever learning to drive and just riding my horse everywhere, even to school! My parent's weren't as enthusiastic as me to say the very least, but they did eventually relent one year and got me a trial horse riding lesson as a birthday present. I loved it just as much as I thought I would, but that one lesson came and went and I never actually did learn to ride a horse. 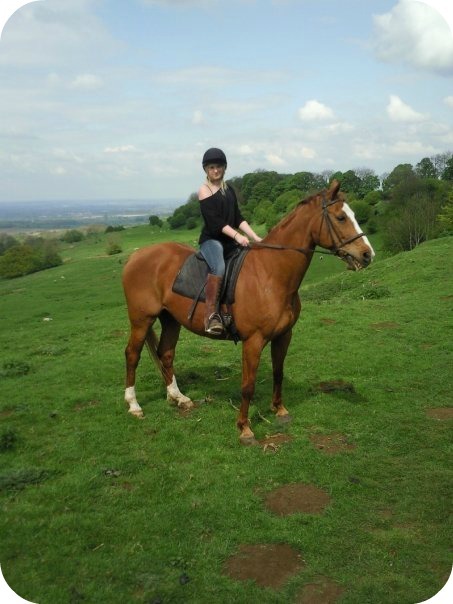 We have always lived in areas where it would have been ideal for me to find a local riding school and learn to ride, there are many riding schools in the area and many people do learn. In fact horse riding is very popular in the area and Luke's Mum even has her very own horse, back in the day this would have made me green with envy! Nope, my horse started to trot...then it started to canter...and the next thing I know is I am hanging for my dear life around the front of the horse's neck. Luckily he took this sign of me no longer being on his back as a sign to stop and let me fall with grace to the floor. My oh my how I wished I had those horse riding lessons as a child! I guess the age old question is 'what is the appropriate age to introduce a child to a horse?' I personally think that if a child expresses an interest in learning then there is no harm in making the introductions, seeing what schools are available in your local area and going from there. If they like it great, book up some more lessons. If not...At least you have fed their creativity and given them the information to make an informed decision. Do you have a child that horse rides or would like to?